Here at WeatherWorks our motto remains the same whatever the season: “interpreting weather data and communicating critical client specific weather information”. Our biggest challenge during the warm season is tailoring our forecasts to a wide variety of clients to fit their needs. These include marine terminals, theme parks, sports teams, facilities, landscapers, public works departments, and colleges/schools districts. The focus becomes more on dry time and the opportunities for outdoor work along with public safety and handling of severe weather, lightning and flooding. So in order to prepare, both our young and seasoned meteorologists go through a pre-summer seminar along with a series of summertime weather tutorials and training. This helps us transition to focusing on warm weather pattern recognition and client impacts, with the four main highlights below. - Damaging winds, hail, frequent lightning, and even tornadoes are a big concern for everyone. From downed tree cleanup, to the safety of individuals at an outdoor event, severe weather is at the top of the priority list. - While less common, the destruction flooding can bring is well noted over the past 10-15 years. It is not just knowing about flooding but also the different types of flooding and the different impacts each causes. For us, poor drainage/roadway flooding, stream and creek, river and coastal flooding are the groups we have broken flooding into. The most common type: poor drainage/roadway flooding as a result of summer-time thunderstorms. - When it comes to doing landscaping and paving work, every dry work hour counts in executing a productive day. Outdoor events, sporting events and especially graduations for schools and universities are also crucial activities which need extensive weather planning operations. - Although less common, tropical storms and hurricanes can bring the highest threat impact across the Northeast and Mid-Atlantic. One only needs to mention Sandy and Irene to spark thoughts about the destruction that these storms can bring in terms of flooding, winds, storm surge, etc. 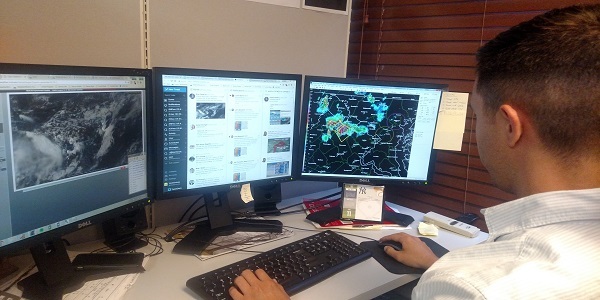 Abraham Lincoln said: “I don’t think much of a man who is not wiser today than he was yesterday.” We never stop learning, and continue to incorporate the latest advancements in technology (Dual-Pol Radar, new GOES-16 Satellite applications) to provide the most useful weather information to our clients. Being available 24/7 isn’t just a feature, it’s who we are. Communication and the human element remain ever important in today’s industry, and it’s the reason why clients continue to trust WeatherWorks when threatening weather strikes.